most attention for the fact that our companies must have at least one female in leadership. We increasingly think that one of our key unfair advantages is that MergeLane runs on principles of Conscious Leadership. 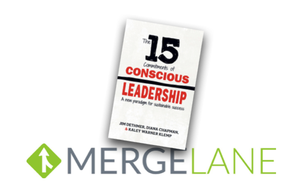 More specifically, we rely on the 15 Commitments and the views and practices from The 15 Commitments of Conscious Leadership, written by Jim Dethmer, Diana Chapman, and Kaley Klemp. The digital home for this work is Conscious.is, and I’ve been fortunate to be involved in it as a student and now a coach for six years. Our model offers a reliable path for leaders, their organizations, families and communities to reach new heights of sustainable success, by giving them the tools to shift beyond a limiting culture of victimhood, blame and self-doubt to a thriving self-rejuvenating culture of responsibility, creativity, genius and self-awareness. A conscious leader is awake, present and engaged. We believe so strongly in the value of this work to leaders that we spend our first full day of our precious first two weeks in residence doing orientation around this material. This helps us to establish the ground rules for our program – curiosity, openness, listening, authenticity, vulnerability, appreciation, and play (yes, play). A core concept of this work is that we as leaders (and people) have a choice between living in a “to me” or “by me” consciousness. From a “to me” perspective, we see ourselves as living “at the effect of” facts and circumstances that happen to us. This is a victim mindset. In a “by me” consciousness, we appreciate our agency, our power to affect the world and our lives as actors. CLG explains these two perspectives as above and below “the line.” Being above the line looks like curiosity, openness, wondering, and presence. Being below the line is characterized by blame, complaint, defensiveness, and rightness. Take a look at this great short video on this model from CLG. Priority one is knowing where you are in a conversation or on an issue. This take on Conscious Leadership is codified in the 15 Commitments, a set of beliefs about self-awareness, curiosity, responsibility, authenticity, candor, mindfulness, transformation, organizational alignment, effectiveness, creativity, innovation, learning, aliveness, engagement, collaboration, organizational change, life balance, and play. I’ve introduced the 15 Commitments to companies I’ve run, executive teams I facilitate, leaders I coach, and every company in our portfolio. Sometimes when I introduce these principles — as I did with a large growth company two years ago — resistance comes first: “we don’t have time to be curious,” “isn’t candor going to result in nothing but conflict,” and “if everyone thinks we have enough, no one will be motivated to do anything.” It’s a pretty predictable path from these objections to seeing clearly how teams often are committed to drama. It’s addictive. Once people see their (often unconscious) commitment to rightness and the debilitating ramifications of that approach to questions, even the most discerning leadership teams see the value of this model. From my experience, implementing Conscious Leadership saves time, reduces drama, maximizes innovation, and nurtures a happier and more engaged workforce. Last year it became obvious that a company I worked with could benefit from a leadership change. Using Conscious Leadership as a framework for considering our options, we had an open, authentic discussion of the issues raised by the current structure. We wondered about how things might look if we made a change, and we arrived at an agreement on a seamless reconfiguration. Having the executive team on board for the shift allowed the change to happen without any friction in the rest of the organization. Last week I met with a founding team I advise as part of a monthly check-in. My first meeting with them came during a crisis moment when the founders were considering breaking up their team. Below the line behaviors were the norm. Things were toxic. Just two months later, I asked what had changed since we met last. The COO calmly replied, “well, I think we’ve basically eliminated gossip across our entire 30-person company. We even let someone go because she was unwilling to give up gossiping.” That’s what you call a drop-the-mic moment for Conscious Leadership. I make every effort to “walk the walk” in my own life and leadership. I do my best to express authentic emotions when they arise. I try to share “withholds” often rather than hold them back until an explosion occurs. Since I, like most of us, spend most of my time “below the line,” I am far from perfect. I get into really stupid arguments about things that I want to control. But I have gotten smarter about the signals, and having exposed so many friends and colleagues to this work, I have a great circle of people willing to call me out. During those times when I’m attached to being “right,” I try to see my own “tells.” I know I talk louder, speed up, gather evidence to support my view, and start to sound snarky. Sometimes I catch this within moments, sometimes days or months. When I do see how far below the line I am, I ask myself whether I’m willing to shift to a place above the line. If so, I take a few breaths, change my body position, or ask an open-ended question that is actually curious (we ex-lawyers are fantastic at asking totally non-curious leading questions). I pause to think of the opposite of my story. I wonder about what I’m choosing not to see. Walking the walk doesn’t always look so elegant. There’s some sprinting, some hobbling, some falling down and getting back up again. The rewards are seemingly infinite even for the small steps in what I imagine is my life’s work in conscious leadership. An avid practice of curiosity at work not only helps me learn faster, it also creates a far more inclusive culture. There is more space for people who aren’t as extroverted or former-federal-prosecutor(ish) to shine. It allows leaders to get the most out of their teams and to function far more effectively in teams where not everyone looks and acts exactly like the leader. The way I see it, Conscious Leadership is rapidly becoming the new normal for attracting and retaining talent and optimizing creativity and engagement. Given that, at MergeLane, we view Conscious Leadership as table stakes. Want to learn more? Apply to MergeLane or attend a Conscious Leadership Camp.